Birmingham City University (abbrev. BCU) is a university in Birmingham, England. Initially established as the Birmingham College of Art with roots dating back to 1843, it was designated as a polytechnic in 1971 and gained university status in 1992. The university has three main campuses serving four faculties, and offers courses in art and design, business, the built environment, computing, education, engineering, English, healthcare, law, the performing arts, social sciences, and technology. A £125 million extension to its campus in the city centre of Birmingham, part of the Eastside development of a new technology and learning quarter, is opening in two stages, with the first phase having opened in 2013. It is the second largest of five universities in the city, the other four being Aston University, University of Birmingham, University College Birmingham, and Newman University. It is ranked third of the five according to the Complete University Guide, below both the University of Birmingham and Aston University. Roughly half of the university's full-time students are from the West Midlands, and a large percentage of these are from ethnic minorities. The university runs access and foundation programmes through an international network of associated universities and further education colleges, and has the highest intake of foreign students in the Birmingham area. The Birmingham Institute of Art and Design (BIAD) was the art and design faculty of Birmingham City University. It has now been merged into the university's Faculty of Arts, Design and Media, and is based at the Birmingham City University City Centre Campus and the Birmingham School of Art on Margaret Street. The main BIAD campus and library is located at The Parkside Building, just north of Birmingham city centre, and about three-quarters of a mile from both Birmingham New Street station and the Custard Factory quarter. It is adjacent to Aston University. 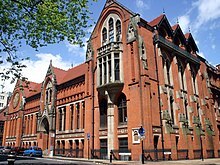 BIAD reached its full maturity in the 1890s, as the Birmingham Municipal School of Art at Margaret Street, under the leadership of Edward R. Taylor. BIAD's archives hold extensive records on the history of art & design in Birmingham, and 20 similar collections have also been deposited with the archives. The Birmingham School of Art was originally a municipal art school but was absorbed by Birmingham Polytechnic in 1971 and then became a part of the BIAD in 1988. Its Grade I listed building located on Margaret Street remains the home of the university's Department of Fine Art and is still commonly referred to by its original title. It currently houses the Centre for Fine Art Research (CFAR). The Birmingham School of Architecture facility was opened in 1908. The City of Birmingham Education Committee was invited to submit a scheme for the establishment of a polytechnic bringing together a number of different colleges in the city in 1967. Late in 1969, the post of director of the polytechnic was advertised. Although the city lagged behind other parts of the country, Birmingham finally gained a polytechnic in 1971—then the 27th in the UK—designated by the Education Secretary Margaret Thatcher as the City of Birmingham Polytechnic. This was the second polytechnic in Birmingham, the first – Birmingham Polytechnic Institution – having existed in the mid-19th century for ten years. In the early 1970s, the Perry Barr campus was the site of building work for what later became the centrepiece of the polytechnic: the Attwood and Baker buildings. Later in the 1970s, the campus was increased in size with the building of what later became the Cox, Dawson, Edge, Feeney and Galton buildings. In the early 1980s, the William Kenrick Library was added to the site. Other, smaller buildings were subsequently constructed, and the estate became known as the City North Campus of Birmingham City University. In November 2003, the university pursued a merger between UCE and Aston University-another university in Birmingham, that, according to The Guardian, "would create an institution of 32,000 students with a £200m turnover". The plans were announced by the then Vice-Chancellor Peter Knight, and approved by lecturers. The new institution would use the established Aston University name, and all UCE staff members' jobs and employment conditions would be kept intact, although Vice-Chancellor Knight would not be part of its management team. He estimated a completion date for the merger of August 2006. The Aston University Council discussed the proposal during a meeting on 3 December 2003 and concluded that it should be rejected. Aston University said that "Whilst the Council respects UCE's distinctive mission, it does not share UCE's analysis of the potential opportunities that might arise from any merger", and cited influencing factors such as Aston's approach to research and teaching, the "significant differences between the missions and strategies" of Aston and UCE, and the negative impact that prolonged discussions would have on both institutions. Aston suggested that it, UCE and the University of Birmingham should instead begin discussions about the three universities' contribution to the future of local and regional higher education. In June 2007, it was announced that the University would be renamed from 'UCE Birmingham', with three possible names being proposed: Birmingham City University, Birmingham Chamberlain University, and Birmingham Metropolitan University. Staff and students (both current and alumni) were asked to complete a survey on what they wished the name to be changed to. On 1 October 2007, Vice-Chancellor David Tidmarsh unveiled the name change from UCE Birmingham to Birmingham City University. 48.2% of those who voted on the survey voted for this name, although 62.1% of staff had voted for Birmingham Metropolitan University. The University of Birmingham Council had previously advised UCE that their preferred choice was Birmingham Metropolitan University, and that it considered Birmingham Chamberlain University "unacceptable" because of Joseph Chamberlain's historic involvement and association with the University of Birmingham. Throughout its history the university has been spread across a number of different sites in Birmingham. Demolition of the Perry Barr campus began in 2018. City Centre Campus, located is the home of Birmingham School of Acting and the Faculty of Computing, Engineering and the Built Environment inside Millennium Point. The Parkside Building, adjacent to Millennium Point and connected to it via a bridge, opened its doors in 2013, housing Birmingham School of Media and design courses from the Faculty of Arts, Design and Media. The Curzon Building houses the Faculty of Business, Law and Social Sciences and the School of English, as well as the library, Students' Union and other support services. Royal Birmingham Conservatoire, moved to the City Centre Campus in 2017. Vittoria Street in the Birmingham Jewellery Quarter, home to Birmingham School of Jewellery. Margaret Street, home of the School of Fine Art, formerly home of the Birmingham School of Art. City South Campus, on Westbourne Road in Edgbaston, home to both the university's health, education and life sciences courses and a moderate amount of student accommodation. The university has completed a "flagship" extension to its campus in Birmingham City Centre, next to the existing facilities at Millennium Point. The City Centre Campus is a £150 million scheme, as part of Birmingham's Eastside development, with design and media students moving into Phase 1 of the development in 2013, from the former Gosta Green Campus and City North Campus, respectively. Business, English, law and social sciences followed when Phase 2 of the new building was completed in 2015. As of September 2017, Birmingham City University invested approximately £220 million into campus infrastructure while moving its campus into the city centre. The university focused on building cutting-edge facilities for students and updating internal systems used for human resources and finance. The university purchased Oracle ERP Cloud and HCM Cloud to update its IT strategy and standardise employee-facing functions, which became crucial in the institution's efforts to modernise its IT infrastructure. Moor Lane is a venue for sports, business training and conferences near to City North Campus. Previously, a dedicated sports centre was located behind The Coppice, a student accommodation block next to the former City North Campus, and included tennis courts, bowls, football and rugby pitches, running track and a social club. The university announced a £7 million sports complex would be built on the site, formerly the Ansells Sports Club, with construction to start in mid-2008 for completion in 2009. The Doug Ellis Sports Centre, named after Doug Ellis, opened on 4 January 2010 and includes a fitness suite, workout classes, and a sports hall. Lawyers at Wragge & Co have advised Birmingham City University on the outsourcing of work for the sports centre to international service company Serco. Under a new 10-year agreement, the FTSE 100 company will run both the sports centre and the existing Pavilion sports facility in Perry Barr. The Coppice and Oscott Gardens are residential halls of residence located adjacent to former City North Campus. The university also offers accommodation in a number of privately owned halls of residence, these include Jennens Court, My Student Village: Birmingham (formerly clv Birmingham) and Curzon Gateway in the city centre. There are also halls of residence at the City South Campus, primarily used by nursing students. After the former Birmingham Polytechnic was granted University status it installed the city's Lord Mayor as its Chancellor each year. It was one of only two national institutions to adopt this link with its local region. On 21 July 2016 the University announced that Lenny Henry would become its new Chancellor, for a term of five years. It has been suggested that Birmingham Institute of Art and Design be merged into this article. (Discuss) Proposed since September 2018. It is also home to the Royal Birmingham Conservatoire, an international conservatoire and junior school and a major concert venue for many of Birmingham's principal concert promoters and organisations, hosting over 300 events annually; Birmingham School of Acting, which merged with the university in 2005 following a period of collaboration; the School of English; and Birmingham School of Media, one of the first media schools in the country to teach media as part of the Skillset Academy Network. Its courses have received approval from the Broadcast Journalism Training Council and the Chartered Institute of Public Relations. The School of English is among the top 20 in the UK, according to the 2014 Research Excellence Framework, with 77% of its research being rated nationally or internationally excellent. Birmingham City University Students' Union is located at the City Centre Campus. There are several reception offices located at all the university's campuses. It is affiliated with the National Union of Students, and all students are automatically members of the union. Student media comprises a magazine, The Scratch and a television station, Tiger TV. The Students' Union also has close ties with the student and community radio station Scratch Radio, which is housed in the Parkside Building at the City Centre Campus. Current and former staff of the University and its former entities include novelists Jim Crace and Stephen Booth, nurse-author Bethann Siviter, journalist Paul Bradshaw, Nigerian researcher and pollster Bell Ihua, scientist Kevin Warwick, environmentalist Chris Baines, politicians Khalid Mahmood (MP for Perry Barr) and Lynne Jones (former MP for Selly Oak), and former Chief Inspector of Probation for England and Wales Paul McDowell. Several work in broadcast journalism, such as Sky News news presenter Marverine Cole and BBC news presenter Charlie Stayt. Art and design alumni include cartoonist Alex Hughes, artist Barbara Walker, fashion designer Betty Jackson, photographer Ravi Deepres and artist Rob Pepper. Graduates in the performing arts include musicians Roy Priest (formerly of Sweet Jesus) and Nick Duffy, singer-songwriter Stephen Duffy, actors Jimi Mistry, Catherine Tyldesley and Tom Lister, comedian Frank Skinner, singer and The X Factor contestant Rhydian Roberts, and bass guitarist John Taylor, founder of Duran Duran. WWE NXT UK wrestler, Jinny (wrestler) graduated in BSc Psychology in 2012, she was also the Student Representative for the department of Psychology. ^ "Birmingham City University : Birmingham City University appoints new Vice-Chancellor". ^ United Kingdom. "Birmingham City University : Our History". Bcu.ac.uk. Retrieved 4 February 2013. ^ "Education". birminghampost. Retrieved 16 July 2015. ^ a b United Kingdom. "Birmingham City University : City Centre Campus expansion – Phase 1". Bcu.ac.uk. Archived from the original on 14 February 2013. Retrieved 4 February 2013. ^ Keogh, Kat (27 November 2012). "University College Birmingham and Newman College to be given university status". Birmingham Mail. Retrieved 13 October 2015. ^ "The Complete University Guide 2015". The Complete University Guide. 1 June 2014. ^ "Profile: Birmingham City University". Archived from the original on 16 July 2011. ^ "Centre for Fine Art Research". Cfar-biad.co.uk. Retrieved 24 March 2014. ^ "BIAD". Biad.bcu.ac.uk. Retrieved 25 March 2014. ^ The Times, Thursday, 8 June 1972; pg. III; Issue 58499; col A "Education battered in political arena"
^ "Amba Wear – The No.1 T-shirt printer in Birmingham". Ambafrogdesign.co.uk. Archived from the original on 16 May 2014. Retrieved 4 February 2013. ^ "Universities consider merger". BBC News. 27 November 2003. Retrieved 6 July 2008. ^ MacLeod, Donald (26 November 2003). "Row over Birmingham universities' merger proposals". The Guardian. London. ^ Donald MacLeod. "Aston merger moves a step closer". The Guardian. Retrieved 16 July 2015. ^ "UCE proposes Aston merger". Times Higher Education. Retrieved 16 July 2015. ^ Donald MacLeod. "Row over Birmingham universities' merger proposals". The Guardian. Retrieved 16 July 2015. ^ a b "University of Birmingham Council: 4 July 2007 Unconfirmed Minutes" (PDF). University of Birmingham. 4 July 2007. p. 4. Retrieved 20 September 2007. ^ "New name for city university". BBC Birmingham. 1 October 2007. Retrieved 2 October 2007. ^ "Freedom of Information request relating to change of name" (PDF). Birmingham City University. Retrieved 27 November 2009. ^ "Birmingham City Students' Union". Archived from the original on 11 February 2010. ^ "Birmingham City University name change". Birmingham City University. 17 September 2007. Archived from the original on 15 December 2007. Retrieved 1 October 2007. ^ a b Shahid Naqvi (1 October 2007). "UCE announces name change". Birmingham Post. Retrieved 2 October 2007. ^ "2007/2008 Name Change Costs" (PDF). What Do They Know. Birmingham City University. 17 July 2009. Retrieved 27 November 2009. ^ Tony Collins (1 October 2007). "New name for Brum's UCE". Birmingham Mail. Retrieved 2 October 2007. ^ Elkes, Neil (15 June 2018). "Demolition work begins to pave way for athletes village". Birmingham Mail. Retrieved 9 March 2019. ^ United Kingdom. "Birmingham City University : Bournville". Bcu.ac.uk. Retrieved 4 February 2013. ^ "Birmingham City University embraces Oracle ERP software". SearchERP. Retrieved 15 November 2017. ^ "Welcome to The Doug Ellis Sports Centre". Citynorthsportscentre.com. Retrieved 4 February 2013. ^ "Birmingham Post: Business news, local news, expert opinion". Retrieved 16 July 2015. ^ U (13 April 2015). "Birmingham City University : Accommodation". Bcu.ac.uk. Retrieved 13 October 2015. ^ "Birmingham City University : Sir Lenny Henry appointed as Chancellor of Birmingham City University". bcu.ac.uk. Retrieved 21 July 2016. ^ "Birmingham City University : Schools and Faculties". Bcu.ac.uk. Retrieved 13 October 2015. ^ "Birmingham Conservatoire". Birmingham City University. Retrieved 6 March 2008. ^ "Birmingham School of Acting merges with UCE Birmingham". Birmingham School of Acting. 30 May 2005. Archived from the original on 4 December 2007. Retrieved 6 March 2008. ^ "PME School of Media : Welcome to Birmingham School of Media". Mediacourses.com. Retrieved 4 February 2013. ^ "Birmingham City University Faculty of Health". Birmingham City University. Retrieved 6 March 2008. ^ "Birmingham City University Faculty of Education". Birmingham City University. Archived from the original on 17 October 2007. Retrieved 6 March 2008. ^ "TEE". Birmingham City University. Retrieved 1 January 2010. ^ "Birmingham City University. Library and Learning Resources Homepage". Library.bcu.ac.uk. Archived from the original on 27 January 2013. Retrieved 4 February 2013. ^ "After a year out on loan Mapplethorpe book is set to return to library shelves". 10 August 1999. Archived from the original on 23 August 2006. Retrieved 6 March 2008. ^ "Research". Birmingham City University. Archived from the original on 1 March 2008. Retrieved 6 March 2008. ^ "Education – The Times". Retrieved 16 July 2015. ^ Asthana, Anushka. "Education" (XLS). The Times. London. Retrieved 26 April 2010. ^ "Birmingham School of Media : About Us". Retrieved 16 July 2015. ^ "Birmingham School of Media". Retrieved 16 July 2015. ^ "University guide 2010: Media studies, communications and librarianship". The Guardian. London. 12 May 2009. Retrieved 26 April 2010. ^ "Certified academies and Testing Centres". Catcemea.org.uk. Retrieved 13 October 2015. ^ "Research - School of English - Birmingham City University". www.bcu.ac.uk. ^ a b c Asthana, Anushka (28 May 2009). "Profile Birmingham City University". The Times. London. Retrieved 26 April 2010. ^ a b "Birmingham City University". Retrieved 16 July 2015. ^ a b "Birmingham City University". The Independent. London. 15 July 2009. Retrieved 26 April 2010. ^ "Birmingham City University". Retrieved 16 July 2015. ^ Asthana, Anushka (13 September 2009). "Profile Birmingham City University". The Times. London. Retrieved 26 April 2010. ^ "Birmingham City University Students' Union". Birminghamcitysu.com. 22 July 2015. Archived from the original on 2 June 2010. Retrieved 13 October 2015. ^ "Media". Birmingham City Students' Union. Retrieved 10 February 2014. ^ "Birmingham City University Students' Union". Birminghamcitysu.com. 22 July 2015. Archived from the original on 17 April 2009. Retrieved 13 October 2015. ^ "Novelist Crace to unveil 'fabulous' £3m library revamp". Birmingham City University. 26 September 2007. Archived from the original on 25 October 2007. Retrieved 2 October 2007. ^ "Stephen Booth – biography". Retrieved 16 July 2015. ^ "Don't get rid of X Factor Rhydian, says Birmingham lecturer". Birmingham City University. 15 October 2007. Archived from the original on 5 March 2008. Retrieved 6 March 2008. This page was last edited on 22 March 2019, at 13:26 (UTC).